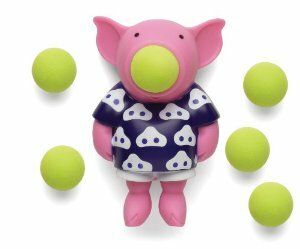 I don’t know if you’ve seen these “popper” toys lately, but when I saw the “Pig Popper,” I just knew I had to have it for a fun center game. I know this sounds like a recipe for disaster in the classroom, but I am super fortunate to have an awesome group of kids who can handle this type of play while learning. 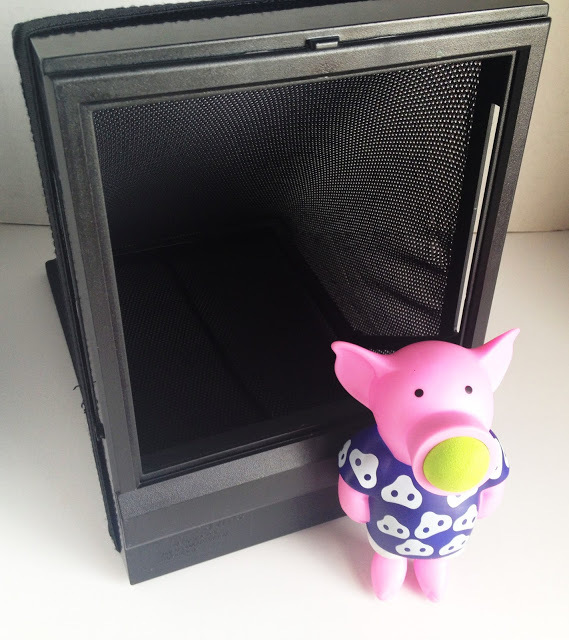 1) I snagged this really cool black net at Goodwill for a $1. This serves as the goal for students to shoot at. 2) I give students poke cards. (In the picture, you can see I used my Equivalent Fraction Poke Cards.) They take turns answering a card. If they’re correct, they shoot the pig popper in the net. If they are incorrect, their turn is up. Here’s a video to show you how my poke cards work. 3) If the ball goes in the net, they score a point. If it doesn’t, no point is scored, and their turn is up. 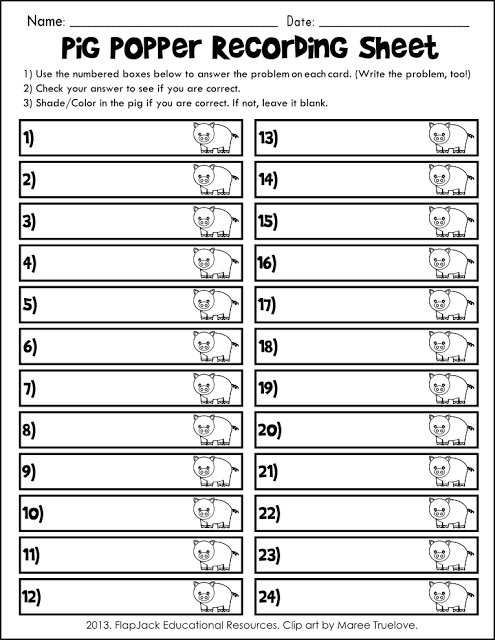 4) Any type of flash cards or task cards would go great with this game format. I have poke cards and QR code task cards that are self-checking that I utilize in this type of math station. To keep it a little more learning focused, I realized a recording sheet would be beneficial. So I’ve created one just for this game. You can grab it for FREE here or click the image below. Cute idea! I think I'll search for a couple of those Poppers to use in different centers. Love the game. Thanks for offering it. I would love to see a frog theme! I would love seasonal spring items. I would also like other seasonal items. I'd love a racing (cars, horses, athletic events) theme–that's my building's theme for the next two years! How about a transportation classroom theme? This is soo cute! Thanks for the opportunity to win it for the classroom. You center is awesome and can be adapted to anything! Love it!! I would love to see a farm theme! Well now, this is just tooooo cute! I love it. Well now, this is just tooooo cute! Well now, this is just too cute!!! I'm thinking a theme on Frogs. Well now this is just toooo cute! I'm thinking about a theme on Frogs. P I G! I can see where it would get a little out of control with some kiddos. I saw some "poppers" (not pigs mind you) at Dollar Tree today. I think they were in the Easter section. I could not for the life of me figure out what I would do with them…now I wish I had bought them! Great ideas…so very cute and engaging for students. 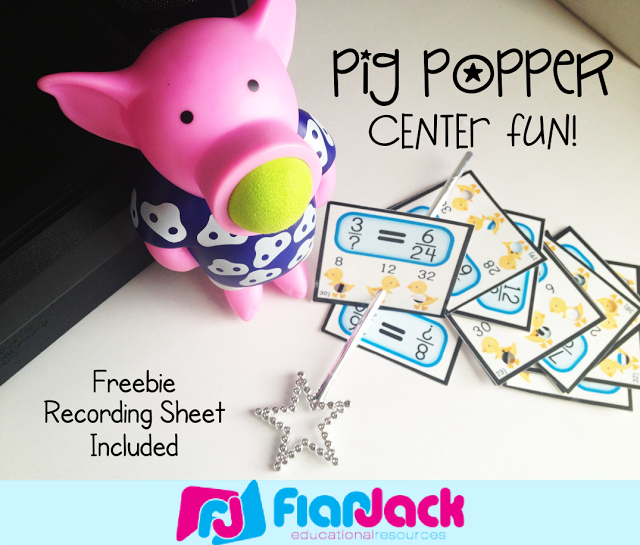 I love the pig popper idea. Such a fun, engaging way to review fractions. I love the pig popper idea. Such a neat way to review fractions. I would love to see a spring flower one!! Thanks! I would love to see a spring flower one!! Thanks!! Such a neat way to review fractions. Polka dots are always fun, or Zebra prints. I would love to see polka dots as well. Love the pig!! owls are part of my classroom- that would have been my choice, but you already have that as a theme- anything with a variety of colors of polka dots and chevron if you don't already make those. How about traditional…apples, pencils, etc? This looks like so much fun! That $1 net was a great find to go with it! I would love to see a puzzle theme ~ how it takes each piece to make the whole puzzle! I think farm idea is a good one. Great motivation for correct answers! What a cute idea…thanks! 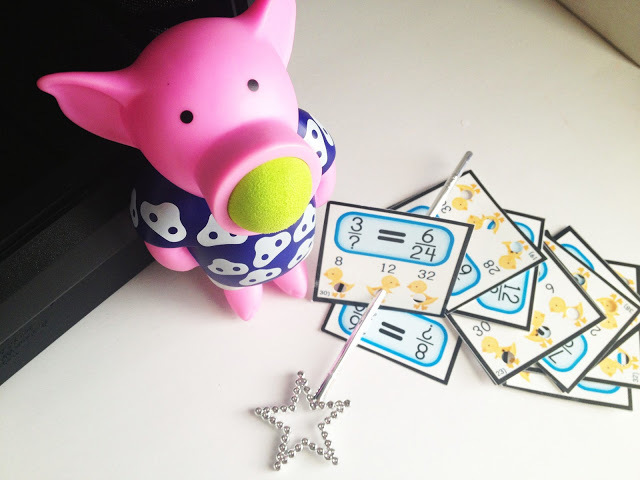 Love that pig.. so cute! This looks like something my students would love. I had a basketball goal in my room at one time to use for remembering sight words. When they were able to read the entire list they got to shoot as many baskets as the word list had. They had a blast. This was in Kindergarten. basketball goal in my classroom one time. I used to as a reward for being able to read sight words. The students loved it. I would like to see a rock star, chevron, or pirates/explorers theme. I really like this idea =) The kids would love it! Thanks for sharing.